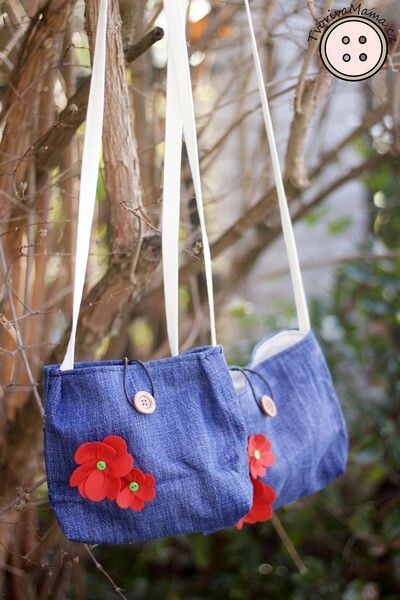 I really enjoy upcycling. 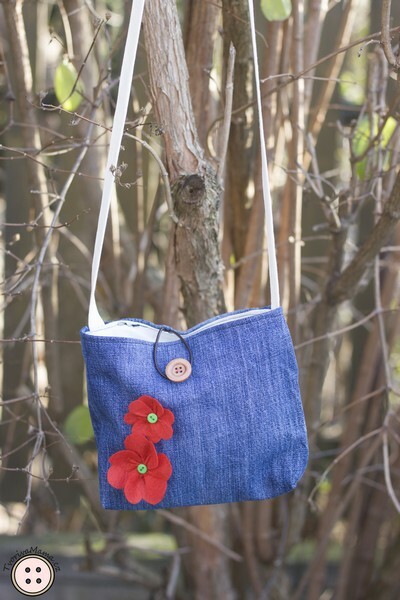 You take something that would otherwise be considered for throwing away and you make it into something useful. 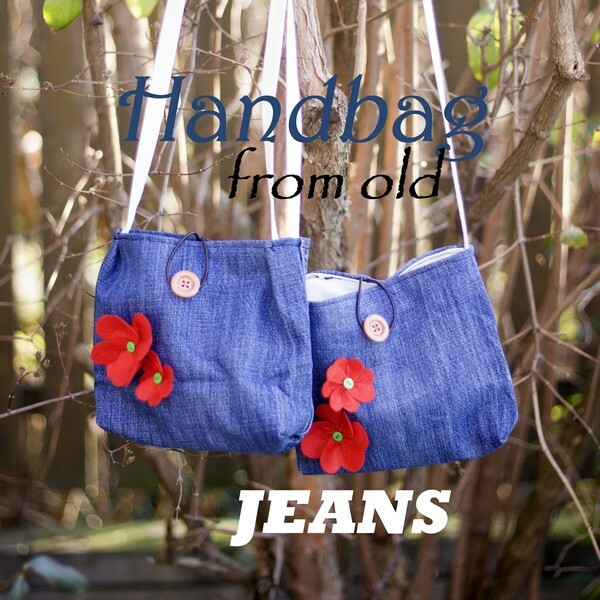 When my husband decided to throw away his old pair of jeans, I prevented this horrible act of waste:) and because they were not completely torn, I decided to make handbags for our girls. There was just enough ok fabric, one girl – one sleeve! 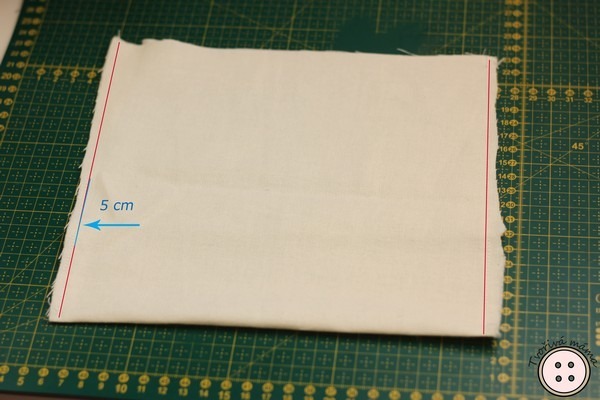 We’ll be using a sewing machine and the seam allowance is 0,5 cm. 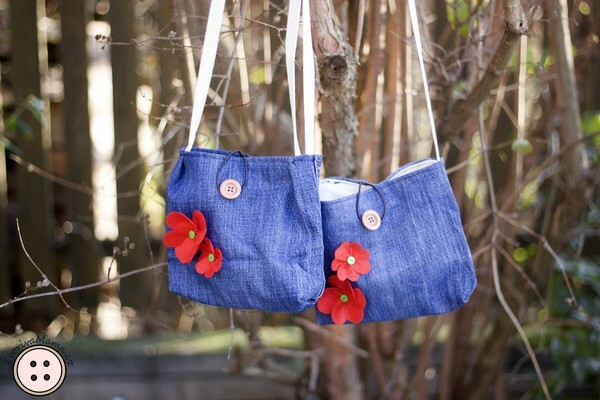 Cut the sleeve as tall as you want the bag to be. I cut it 20 cm tall and the width of the sleeve is 22 cm. Therefore, I have a rectangle of 20 x 22 cm, tor rather two rectangles joined at the sides. Cut exactly the same two rectangles from the canvas. 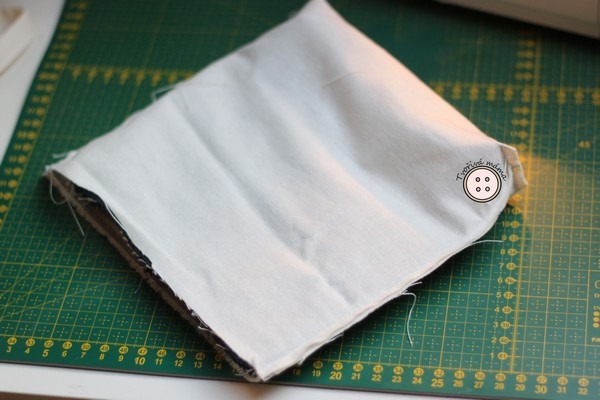 Or cut one rectangle 22 x 40 cm and just fold it in half. Now you’ll be working with the canvas. 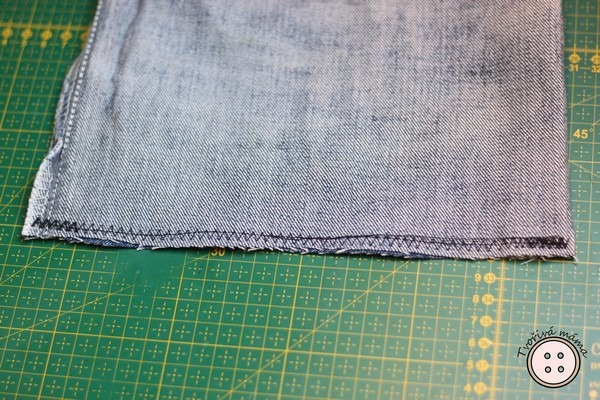 If you have two separate rectangles, sew one of their long sides together, then sew both shorter side. 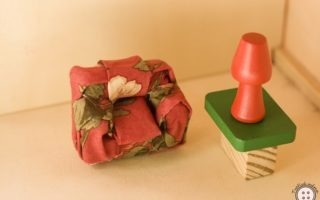 If you have a large rectangle folded, sew just the short sides. Leave a 5cm open gap on one of the sides (blue line in the photo). Let’s work with the corners now. 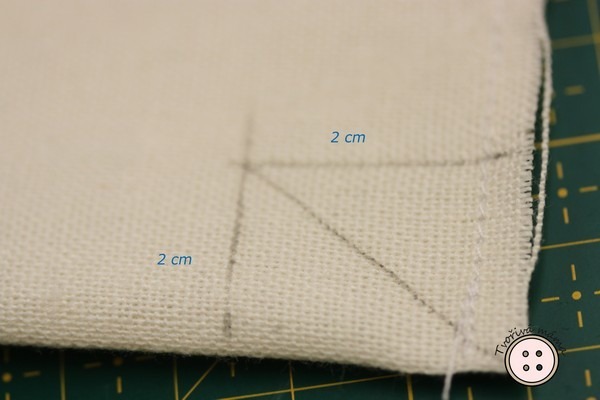 Measure 2 cm from both sides of the corner and join both points. Then join their intersection with the corner. 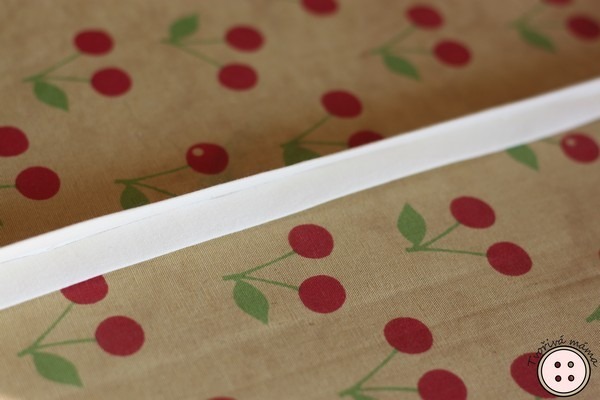 Do the same this in the other corner, then turn the canvas around and repeat on the corners from the other side. 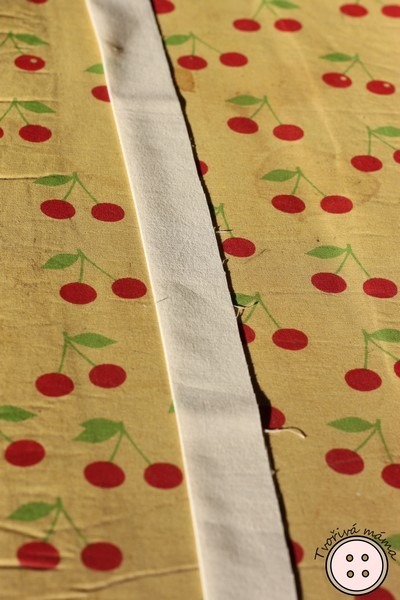 Open both corners and sew where the straight line is. That will be your tuck. 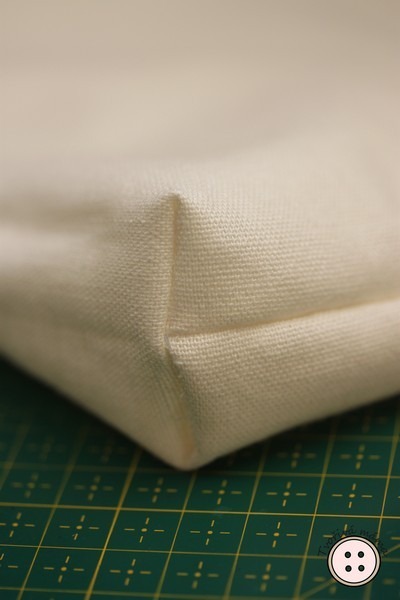 When you turn the lining right side out this is what the tuck will look like. Now for the jeans. 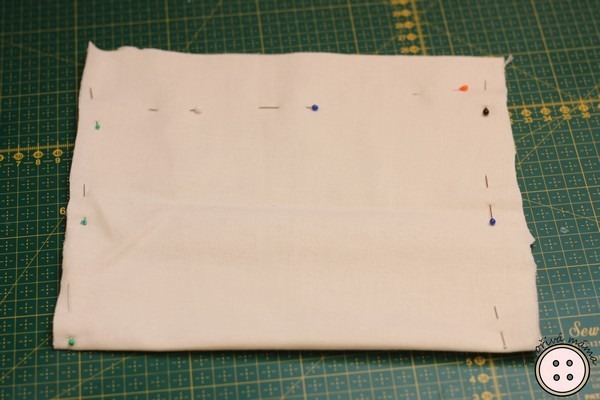 The sides are already joined, so sew just one of the long sides, that will be the bottom of the handbag. 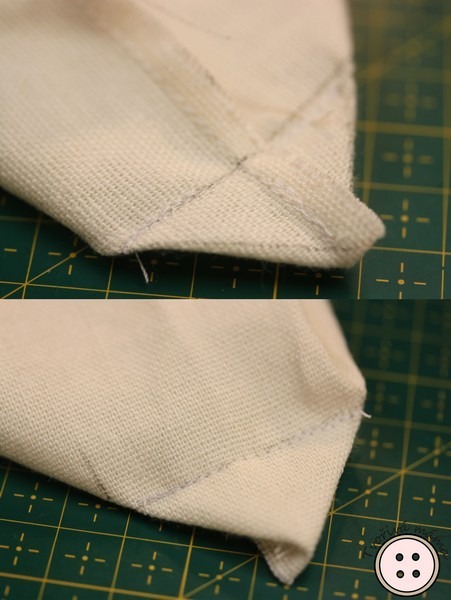 Repeat the steps to make the tucks. Don’t forget to make them in both corners. 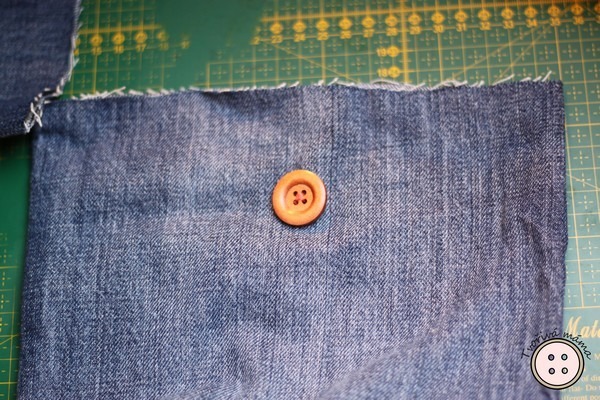 Hand-sew a button close to the upper edge of the jeans. 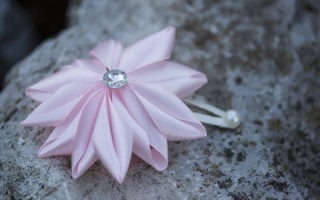 Now is also the time to sew on any decorations. 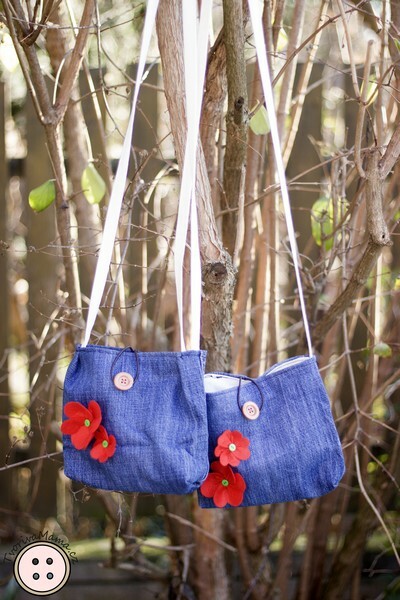 Mine are too big and I feared I could ruin them when I turn the bag right side up later, so I sew them on in the end. 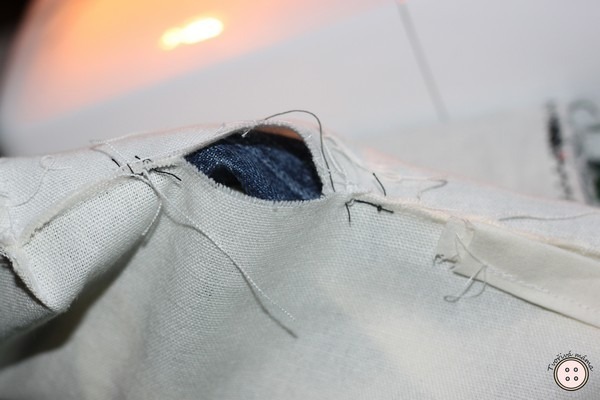 It’s quite uncomfortable though because you have to avoid sewing through the lining. 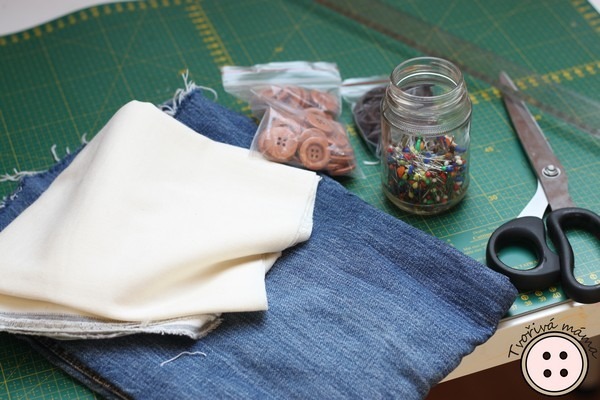 Now work on the other side of the jeans, at the opposite upper edge. Sew on the string that will be the button loop. 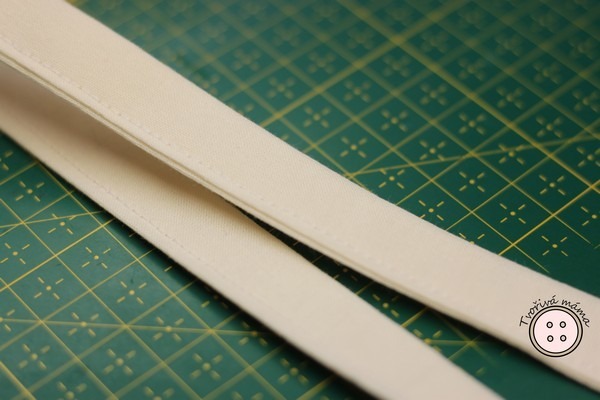 Measure first so the loop is exactly ooposite to the button. The loop has to be directed towards the bottom of the bag. Let’s make the handle now. 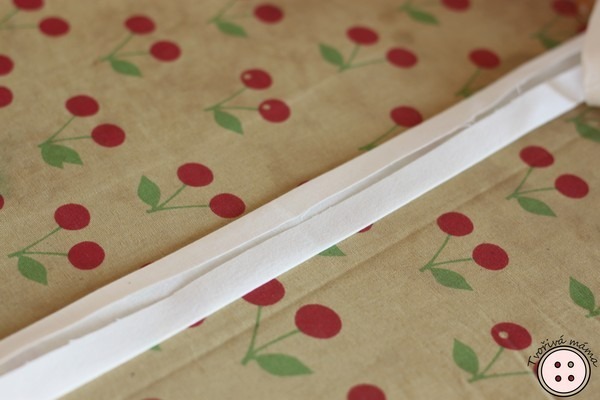 Cut a canvas stripe 6 cm wide and 100 cm long (although you can choose any other length as well). 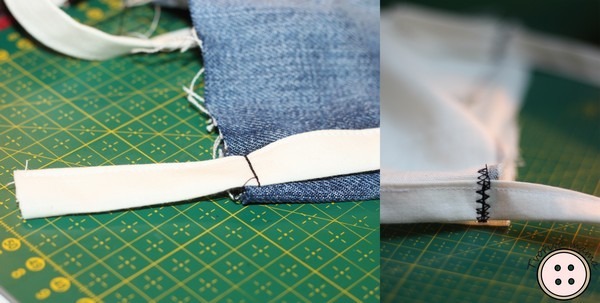 Fold the stripe lengthwise and iron flat. Open. Now you can see the central line. 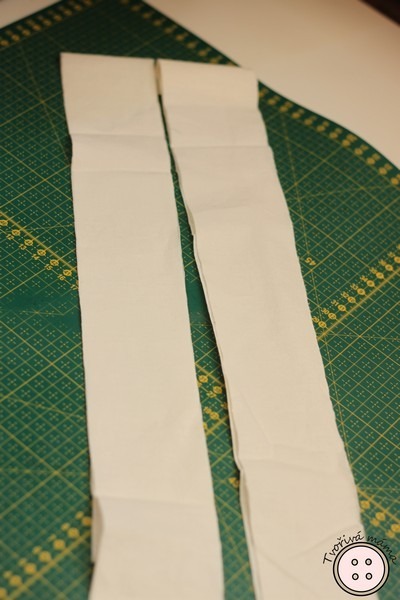 Fold the edges lengthwise to the central line. 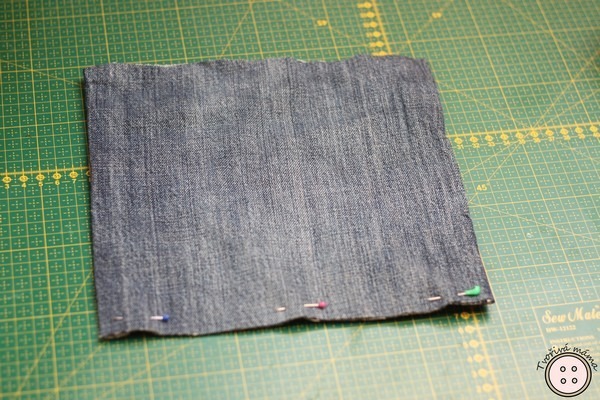 And now fold the stripe lengthwise again. 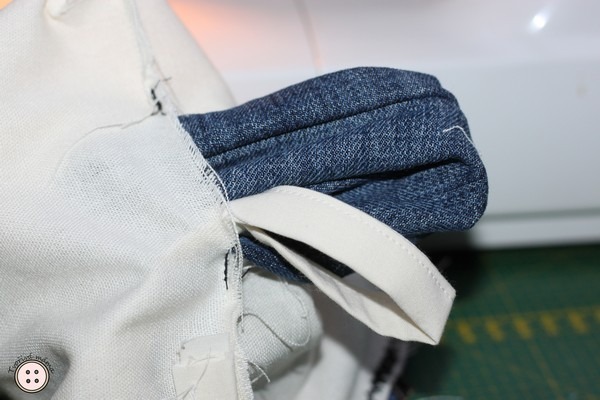 Sew the handle to the jeans part or the lining. 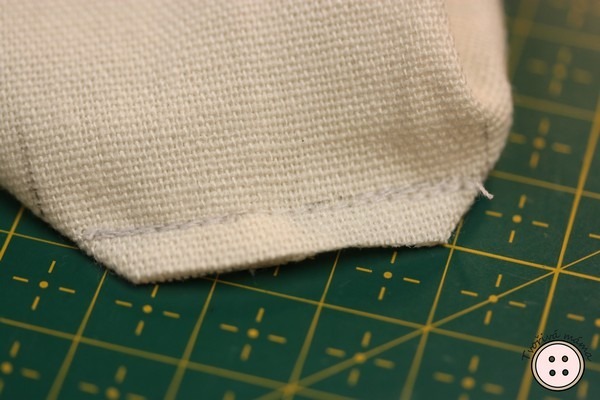 It’s important that you sew both ends in the seams that join the short sides of both rectangles. 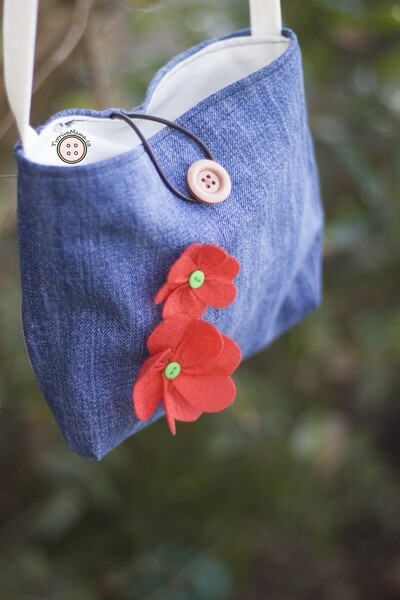 The handle must be directed towards the bottom of the bag, the ends of the handle should stick a few centimeters over the upper edge. 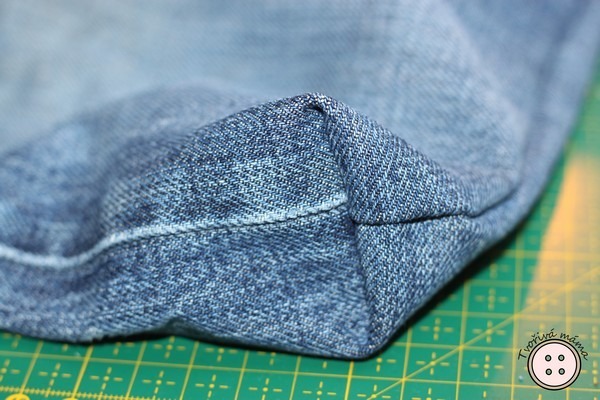 Leave the jeans part turned right side out and turn the lining the wrong side out. 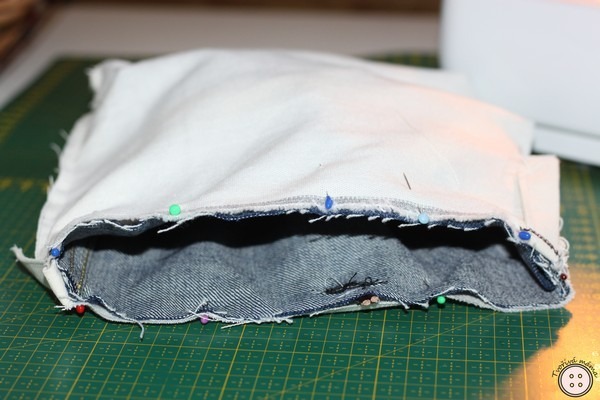 Place the jeans inside the lining. Align the bottoms and the upper edges. The handle must be inside, between both layers. 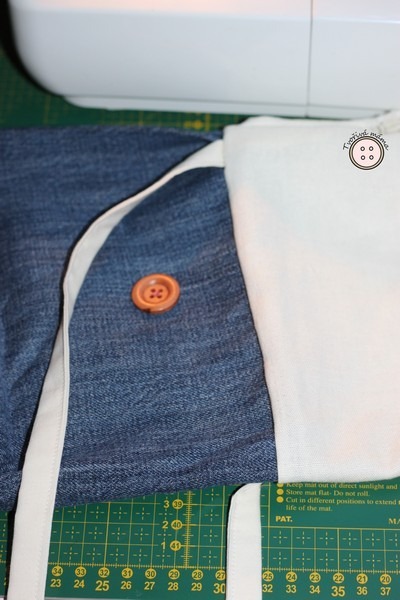 Pin the upper edges of both layers and sew them. 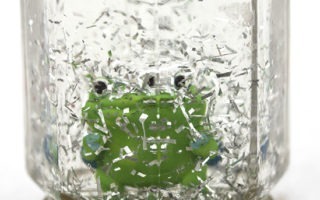 Do you remember the 5cm gap? 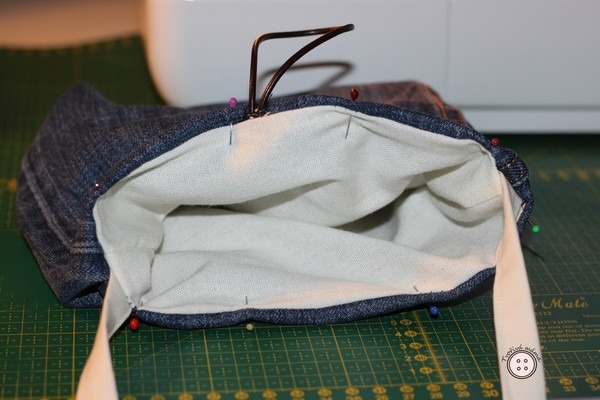 Now you have to pull the jeans, the handle and finally the lining through it. Work slowly, this small gap is enough. So now you have both parts right side out and sewn together. 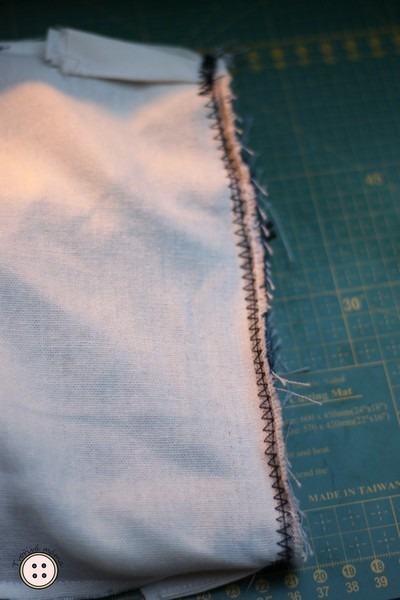 Sew the gap in the lining with the hidden stitch. The tutorial is here. 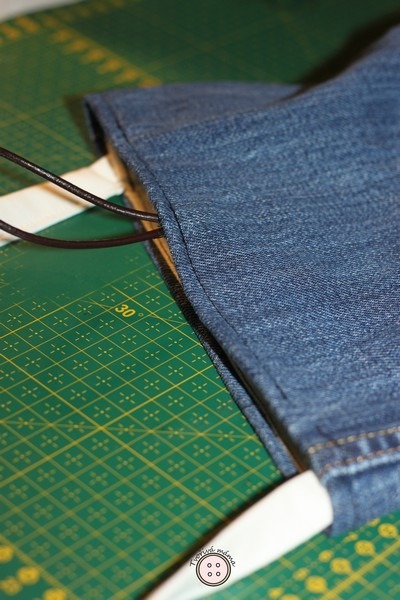 Place the lining in the jeans and align the edges. You might have to iron and pin them. 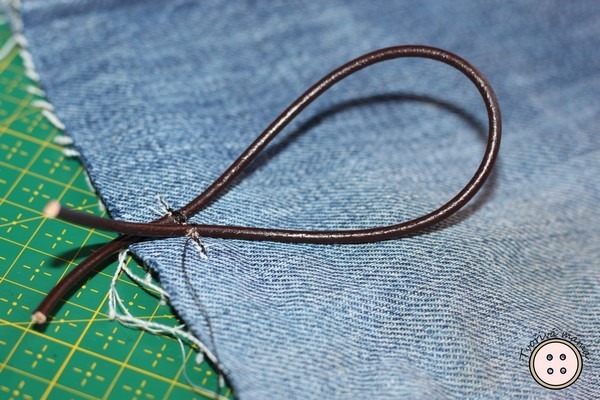 Sew the edges about 0,5 cm from the edges. Done!